Amidst the fury of finger pointing and propaganda surrounding the crisis in Ukraine, the familiar specter of anti-Semitism has resurfaced. In the eastern Ukrainian city of Donetsk where pro-Russian militants have taken over government buildings, Jews were told they have to "register" with the Ukrainians who are trying to make the city part of Russia. The incident, first reported by Israel's Ynet News, describes how Jews emerging from a synagogue in Donetsk were handed leaflets on Monday that ordered the city's Jews over the age of 16 to provide a detailed list of their property and pay a $50 registration fee "or else have their citizenship revoked, face deportation and see their assets confiscated." The leaflet was written in Russian, bearing Russia's national symbol and the signature of Denis Pushilin, the Chairman of Donetsk's temporary pro-Russian government, where activists have declared the city an independent "people's republic." U.S. Secretary of State, John Kerry, confirmed the existence of the leaflets and was quick to condemn the action as "grotesque" while in Geneva. U.S. State Department spokeswoman, Marie Harf, said they were continuing to gather information on the matter. What is indisputable is that the leaflets were printed and distributed to Jews in Ukraine. The question, then, is who is responsible for them? Is it official Russian policy, the policy of Pushilin and the Donetsk separatists, or an isolated act by a few anti-Semitic pro-Russian activists? Or is this a propaganda effort aimed at turning opinion against pro-Western Ukrainians? To fully grasp this anti-Semitic action, one must understand that this is happening in Russian-controlled portions of Ukraine. 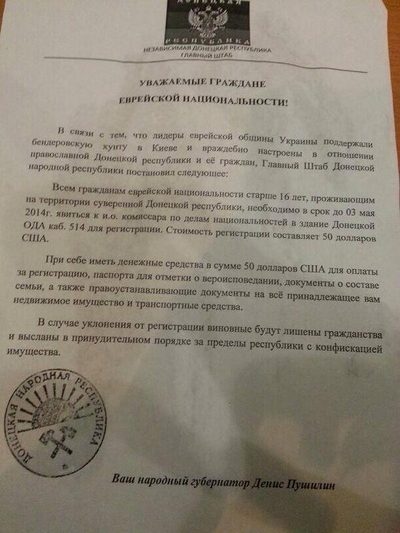 In other words, it is not general Ukrainian anti-Semitism; it is Russian in origin. This tracks with deepening anti-Semitism within Russia itself and the rising tide of anti-Semitism across Europe and the world. If there is something about the situation in Ukraine that sets off alarm bells in the collective Jewish memory, it is with good reason. Throughout history, Jews have been the default scapegoat for despots. This is felt acutely in Ukraine, which was one of the most enthusiastic locations for the Holocaust during the Nazi occupation. They supplied SS troops to the Nazis and a large number of Ukrainians joined special military units of the Wehrmacht or served as guards at concentration camps throughout the Third Reich. [Jews] of the city of Kiev and vicinity! On Monday, September 29, you are to appear by 7:00 A.M. with your possessions, money, documents, valuables and warm clothing at Dorogozhitshaya Street, next to the Jewish cemetery. Failure to appear is punishable by death. 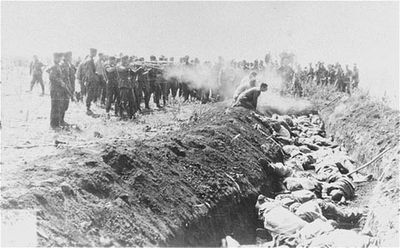 The massacre of Jews at Babi Yar on the outskirts of Kiev, Ukraine in 1941. From the cemetery, the Jews were marched to Babi Yar, a ravine only two miles from the center of the city where they were stripped naked and shot. During the course of two days, the special team of German SS troops, supported by local Ukrainian collaborators murdered 33,771 Jewish civilians. It is no wonder that the call for Jews to register today in Ukraine is reminiscent of the past horror suffered by the Jews of Kiev. The timing of the leaflets also dovetails with the Jewish memory of suffering in Ukraine, coming as it did with the start of Passover. Historically, the Passover period, which usually corresponded with the Christian Holy Week, was the worst time for the persecution of Jews, often culminating on Good Friday. This current act appears to be intended to revive those fears. What, then, could be the political purpose motivating this recent anti-Semitic episode? Russia has a track record of using propaganda in Ukraine and it has used the specter of anti-Semitism in a cynical manner since the anti-government protests began. Part of the ruse has been to equate the Nazis and Hitler with the pro-Western government in Kiev. If this method of playing both arsonist and firefighter sounds familiar it is because it is the same pattern seen today in Syria where pro and anti-regime forces commit atrocities and blame the other in a bid to garner international sympathy. In the past few months, Russia and its allies in Ukraine have issued multiple stories about the threat posed to Jews by Ukraine's new pro-Western government in Kiev. So far these threats have proven to be false but the recent leaflet episode could be an attempt by Russia or its proxies in eastern Ukraine to create the basis of disinformation about the Kiev loyalists. This would fit with current and previous Russian propaganda aimed at providing Moscow with a pretext to invade parts of Ukraine ostensibly to protect whoever President Vladimir Putin decides is in Russia's interest to protect. With that in mind, it is absurd but not difficult to imagine a scenario where Putin fashions himself the protector of Jews, using Jews as a pretext to invade eastern Ukraine. Whatever the motive is, this much is clear: Throughout history, Jews have been the proverbial canary in the coalmine, a bellwether indicating a slide toward greater authoritarianism, fascism, and xenophobia. This episode should therefore serve as a wake-up call to the world. If "never again" is supposed to mean something, we need to mobilize to prevent this type of activity—which, as history has demonstrated, is usually a precursor for much worse things to come.